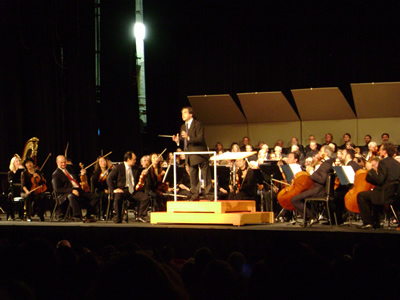 On Wednesday evening, September 18, conductor Riccardo Muti directed a concert at a Westside Chicago area high school, Morton East in Cicero, Illinois, to a full house of parents and neighbors, about 2400 people. In the midst of a raging storm, reminiscent of a well-staged scene from Rigoletto, local citizens poured into the auditorium to hear this beautiful free Brahms-Verdi community concert. The concert began with the entire Second Symphony of Brahms. The rest was Verdi: two selections from La forza del destino, featuring two strong singers, Barbara Frittoli and Luca Dall'amico (both of Italy) and the Men of the Chicago Symphony Chorus. Then from Nabucco: Va pensiero, featuring the community choruses: City Voices, Kol Zimrah, North Shore Choral Society, Wicker Park Singers and the choir of J. Morton East High School. And, in the order of composition, this was followed by the Nabucco Overture. Both the performance and the audience response were tremendous. The school's lovely roccoco auditorium was packed, and at the end, conductor Muti was so moved by the response of the largely uneducated audience,which had applauded between each movement of the Brahams, he said, "I wasn't supposed to say ANYthing, but..." And then he expressed a sentiment reminding me of the role that Furtwangler played in decadent and despondent Germany. He referenced the Metro-Goldwin-Mayer lion surrounded by a wreath and the words in Latin, which he asked the audience if anyone knew what it said. A man in the audience called out the words in Latin, and then translated it: "Art for Art's Sake". Muti asserted that in this crazy world, it is so necessary for the people's sanity, to experience that, as well as "love, for love's sake". And the most important of the arts for unifying the people is music! He said that he was very happy to be finally in Cicero (pronouncing it in Italian, "Chi'-cher-o") to gales of laughter. He said he had been studying "Chichero" (the Italian philosopher) all his life, and now he was here! Riccardo Muti started this “Music for The People” when he took over the Chicago Symphony Orchestra (CSO) in 2010. The CSO is now involved in all kinds of community outreach, where people are allowed to attend certain of his rehearsals for free; and the first concert of the season every year, is performed for free admission in one of the many and varied Chicago neighborhoods. They also have outreach into the neighborhood schools to bring in youth for lessons and into choruses. According to the program notes from this concert Muti had been the head of the Maggio Musicale Fiorentino, the Philharmonia in London, the Philadelphia Orchestra, and the Teatro alla Scala in Milan before he came to Chicago. He has conducted orchestras in concerts all over the world and has received the highest awards of State from the Vatican (under Benedict XVI) to the honorary Knight Commander of the British Empire (which would explain from what position he confronted Prime Minister Margaret Thatcher on the insanity of the Iraq War!! ), to Russian President Vladimir Putin awarding him the Order of Friendship. The first recording the CSO did, when Muti took over, was of Verdi's Requiem Mass. His first book was Riccardo Muti: An Autobiography: First the Music, Then the Words.